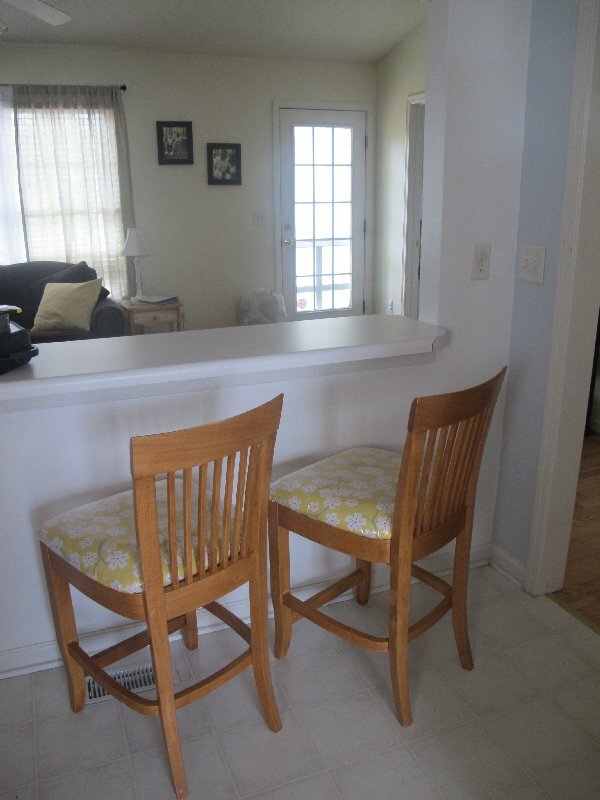 In our kitchen we have this lovely little bar/breakfast nook that separates the kitchen from the living room. It has a great archway that allows you to see from one room to the other. We have these 2 tall chairs that are the perfect height for eating at the breakfast bar. We actually do eat breakfast there every morning. We found the chairs in the garage of someone who was moving way back when we were first married and living in Florida. 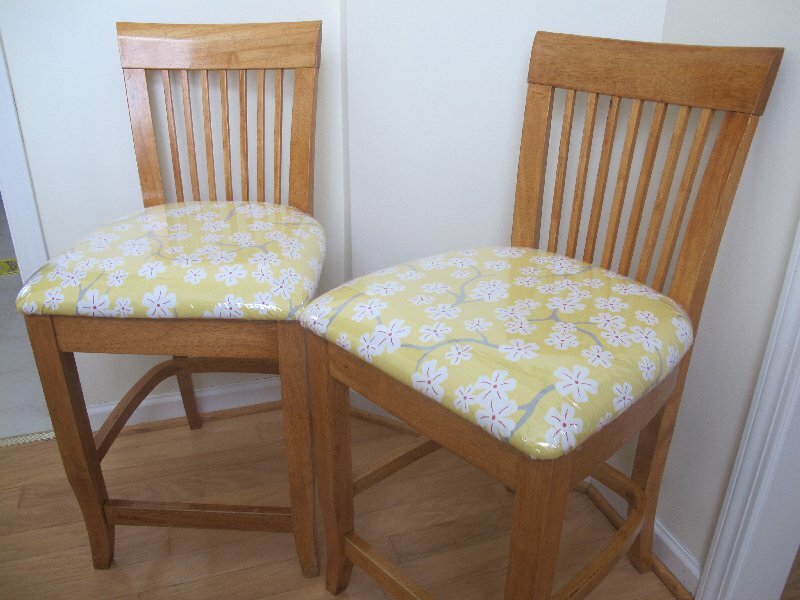 That is when I did my first fabric re-covering of these chairs, with the help of my handy mother-in-law. Unfortunately, since then, Ande has spilled every kind of food and drink you can think of on the cushions of these chairs. They looked so gross and stained that I couldn't bear taking a "before" picture. I wouldn't even let my best friend sit on them when she came over the other night, and she's practically a sister to me! Anyways, I finally picked up some fabric and clear plastic to cover these babies. I really thought this was going to be an easy project, but it turned out to be pretty tedious. I had to wait for Curt to get home to help me. I couldn't get the staples from the staple gun to go all the way through the bottom of the cushion...I'm so weak! But that wasn't even the hardest part. 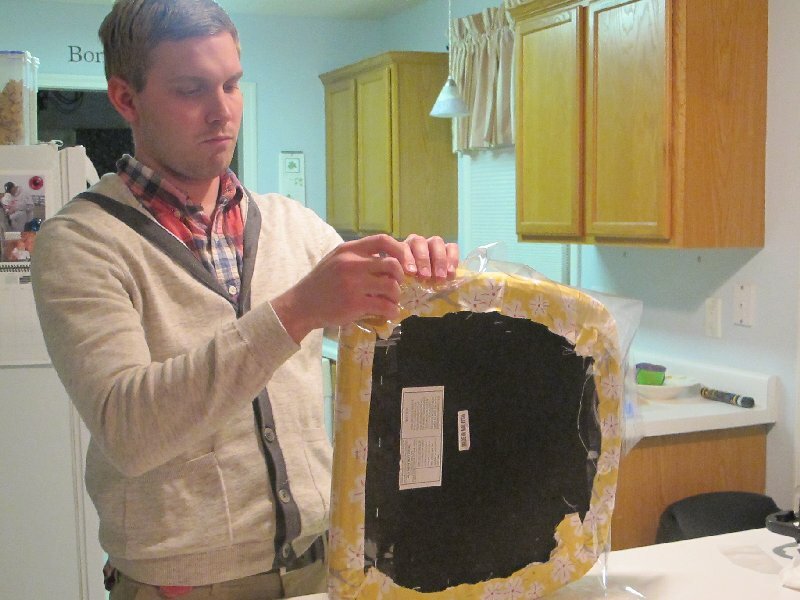 Getting the plastic wrapped around the cushion just right turned into quite the arduous task. 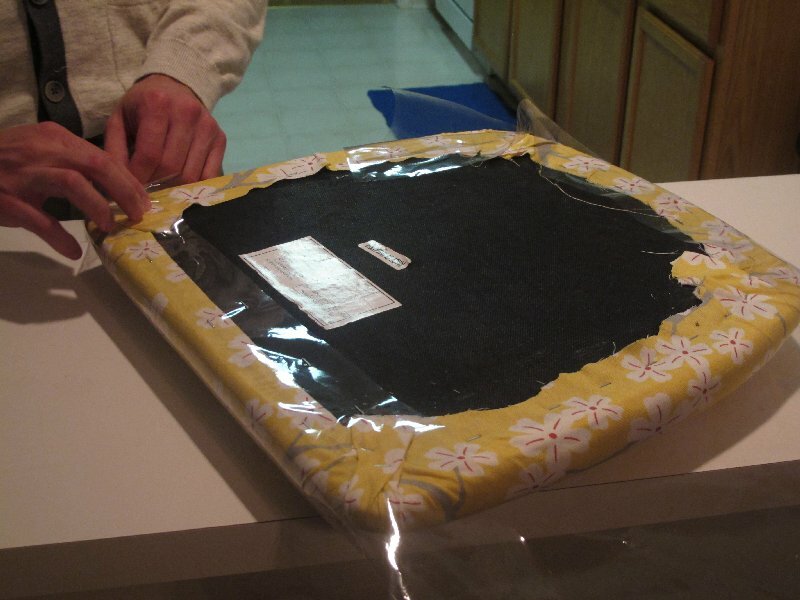 We tried so hard to wrap it over the rounded corners without leaving too many wrinkles on the top, but it seemed quite impossible. Luckily, Curtis was there to do most of the work. He has this awesome ability to just keep working and working until a project is completely finished (which I know for a fact comes from his side of the family!). What great stamina! I was ready to take a break when we finally stapled down the very first corner. It took so long just to get that done, I was exhausted! 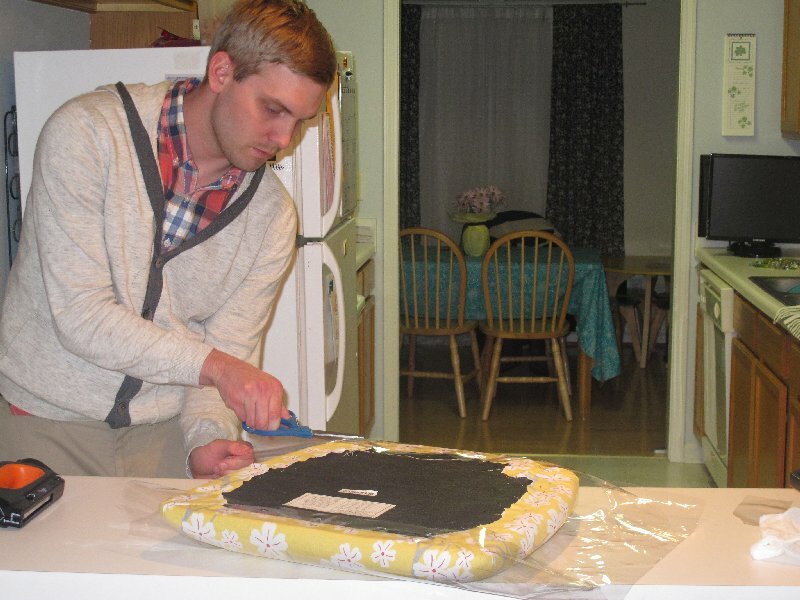 But somehow, Curtis just kept at it and didn't stop until both cushions were complete! Besides picking out the fabric (which I LOVE), I was only helpful when it came to drilling the cushions back to the chair frames. I had to sit on top of them while Curtis drilled from below. He needed my big hunk of body weight to hold the cushions in place. I was worried the screw would come right up into my bum! Since you didn't see the before, it'll be hard for you to know what a big difference this new fabric has made! I love that we can easily wipe these chairs down after a milk or ketchup spill and they will still look as good as new! 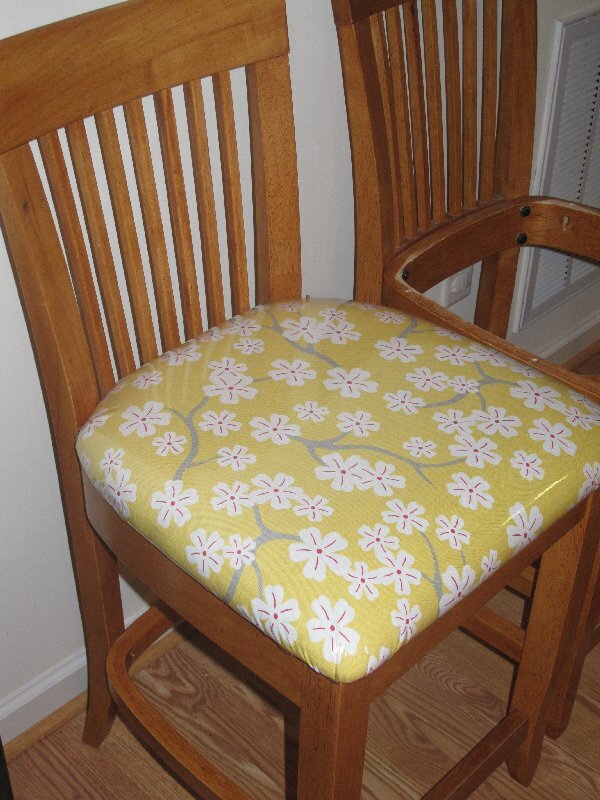 Most of all, I love the pop of color that the yellow cherry blossom fabric adds to our kitchen! Yellow is my absolute favorite and I'll sneak it into our home decor as often as I can get away with it! My focus could only have come from my side of the family... I think you were thinking Ande when you wrote that. Nice old man's jacket Curt (dork)! I like the chairs & breakfast bar. I miss ours in Birmingham. Way cute. I love the pattern and I love that you can wipe them down. I need to put vinyl on my chairs...and my couches and the carpet for that matter.